Housed in a 4-panel wallet. 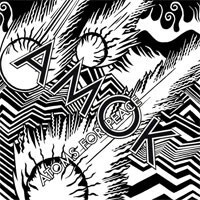 ‘Amok’ is the debut album from Thom Yorke (Radiohead)’s new project Atoms For Peace. Atoms For Peace include Thom Yorke (vocals, keyboards, programming, guitars), Nigel Godrich (production & programming), Joey Waronker (drums), Mauro Refosco (percussion), Flea (bass).